Good morning! I made a delicious and simple dinner last night that was so good I just have to share it with you guys. Introducing: Gluten Free Mexican Chicken Casserole! 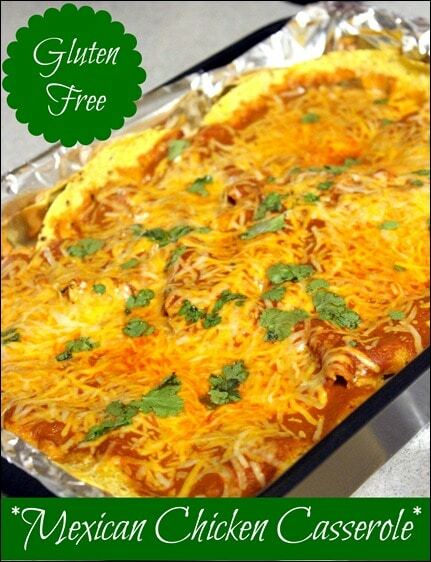 I was originally planning on making my Healthy Chicken Enchiladas (click for recipe), but was in the mood to get creative based on what we had on hand, so a new creation was born! Scroll down to see some pictures of the process, but here is the full recipe. 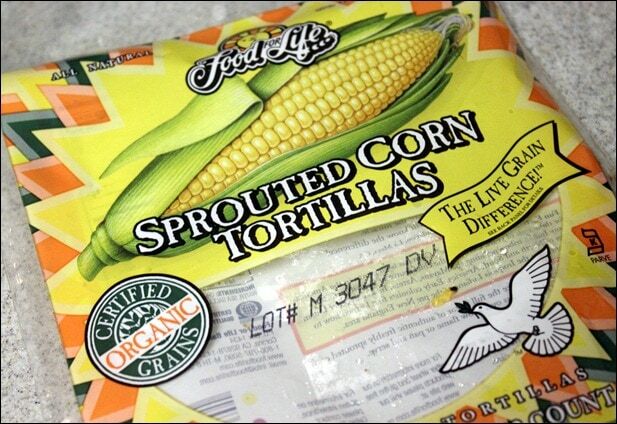 I love these Ezekiel sprouted corn tortillas – no weird additives or hydrogenated (trans fat) ingredients. The chicken/black bean/avocado/yogurt/etc. mixture – looks gross but it was REALLY good. I used a rotisserie chicken from Whole Foods for the chicken – quick and easy. Plus, now we still have some chicken left to use in meals later this week! Instead of sour cream, I used Greek yogurt – my favorite is Stonyfield’s Greek 0% plain. It’s organic and doesn’t have any additives. 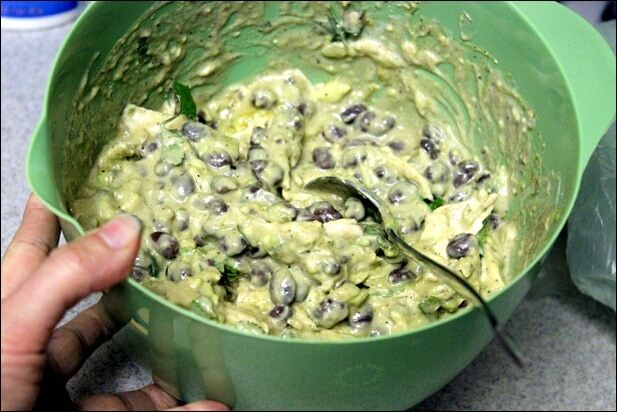 For the guacamole, I used store bought but you can make your own if you want. Whole Foods has epic guacamole. And then putting on the top layer of tortillas and topping it with the enchilada sauce, cheese, and cilantro! I used this enchilada sauce, also from Whole Foods. 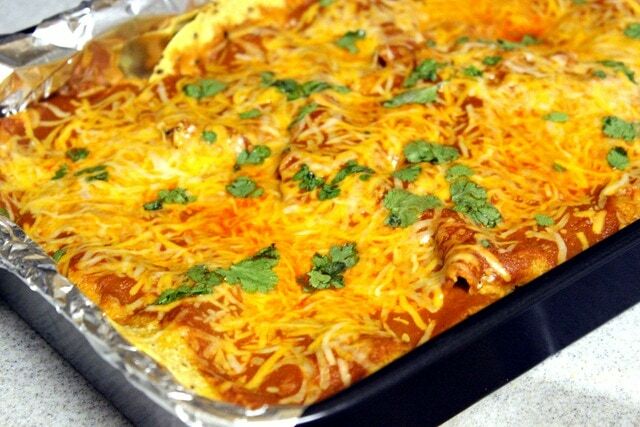 If you want to make your own, check out my recipe for homemade enchilada sauce (it’s within the recipe for my Healthy Chicken Enchiladas)! 15ish minutes later and it was ready to eat. So good – Matt and I both loved it. Serve alone or with a side salad. Enjoy! Previous article: EX2 Adventures Backyard Burn Trail Race + Hiking! Next article: Happy Registered Dietitian Day! My chicken cravings are OUT of control these days! :) This could sooth them! This looks amazing – Approx how many servings would you say it is? 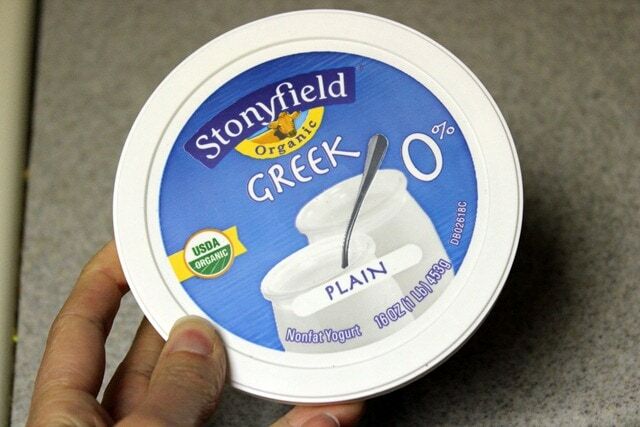 The serving size is shown in the recipe (next to Ingredients) — it serves 4 hungry people, or maybe 6 if you’re having a side salad with it. Whoops! Read over it too fast – Thanks! I’ve never thought of mixing guac in with the chicken mixture. Genius! I usually cook my chicken in the crockpot so it’s ready to go when I get home from work. I usually dump some salsa and green chilies over some boneless/skinless chicken breasts and it is super easy to shred. You know the show Semi-Homemade with Sandra Lee on Cooking Network? Well, this looks like a much more appetizing version of something she would make (I think a lot of her stuff is gross, sorry). I love that you show how quick and painless it can be to throw together a fresh meal that is both delicious and nutritious. This looks really yummy–I am looking forward to trying it. 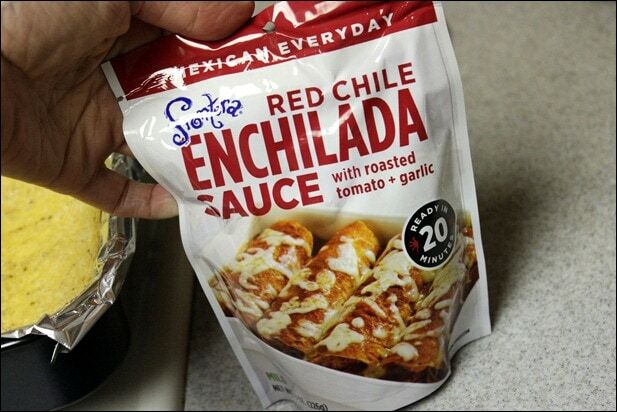 I use Frontera salsa for a salmon dish using a Rick Bayless recipe, but have never tried the enchilada sauce before. I haven’t tried their salsa but I loved the enchilada sauce! sighhh looks so good, but so much dairy :( I want it anyways!! 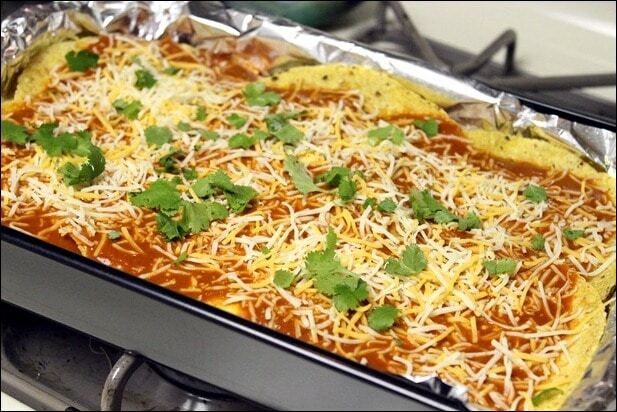 Yum.. looks delicious.. and I miss Mexican food…. France FAIL! This looks so good! I think my family (my sister and mom are also usually GF) would love it too, I gotta keep it in mind for the next family dinner! Awesome, thank you! Great tips. Sounds great and simple! Can’t wait to try. 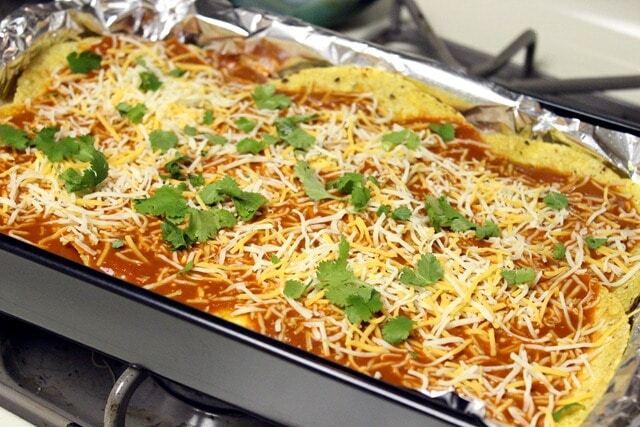 Just made this for dinner tonight and it was easy and yummy. 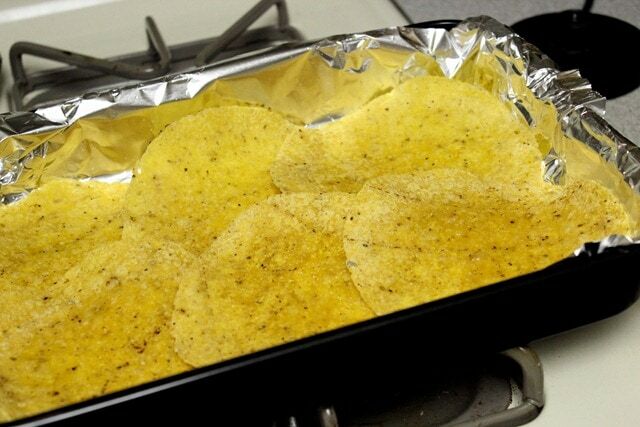 I used ancho chile powder, which gave the dish a smoky flavor. Thanks for another great recipe! Yum I’ll have to try that next time! 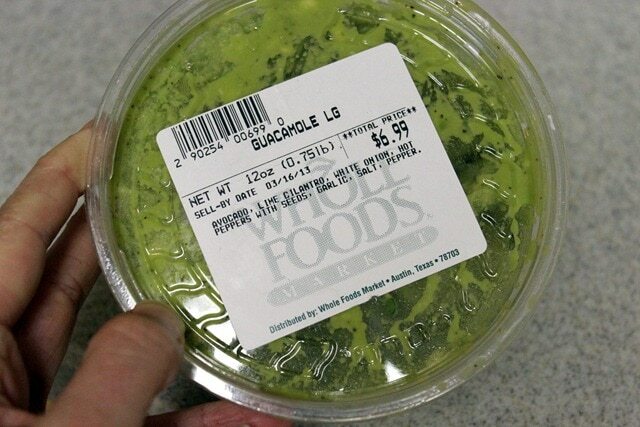 If I could just make a suggestion, for people who are new to the Gluten Free World, please put in your recipes that they need to purchase only Gluten Free enchilada sauce and I don’t know of any stores that I would purchase a rotisserie chicken. They are usually not Gluten Free either to the contamination or spices that they put on the chicken. This recipe looks very good and I can’t wait to try it. This is a great tip – thank you! I made this tonight and it was a huge hit!! 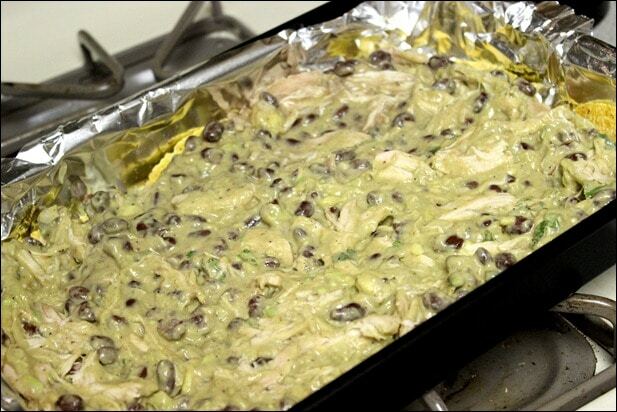 I added some green chiles to the chicken mixture and it was DELISH!!! Thanks for sharing!! Thanks for this recipe, can’t wait to try it! So we have to cover the tray with foil on top before placing into oven? Yep! Helps to keep the tortillas from drying out. Hi Anne. Thanks for sharing such a lovely recipe. I am a comfort food fanatic, but it’s not easy to find a good healthy version them. So glad I came across your website! It looks so simple and yummy! The best part is that most ingredients listed here, most of us probably already have at home. This is a great and very fast recipe.